I have another recipe for you inspired by my time in Seattle! These treats are not from Seattle, but from a little shop in Vancouver, BC, where my friend Erin lives – who is a total plant-based rockstar, by the way. During our stay in Seattle, Erin gifted me a little Vancouver goody bag, and my favorite item from the bunch was a package of double chocolate raw macaroons. Swoon. One bite in and I knew I wanted to recreate them at home. This recipe is simple, requiring 6 ingredients and about 30 minutes to prepare. It’s also raw, meaning the ingredients are raw and are not heated above 104 degrees Fahrenheit (40 C), in order to preserve the vitamins and nutrients – which means more of the good stuff makes it into your body. Win win! While I had tried making baked macaroons before, I hadn’t tried making a raw version. 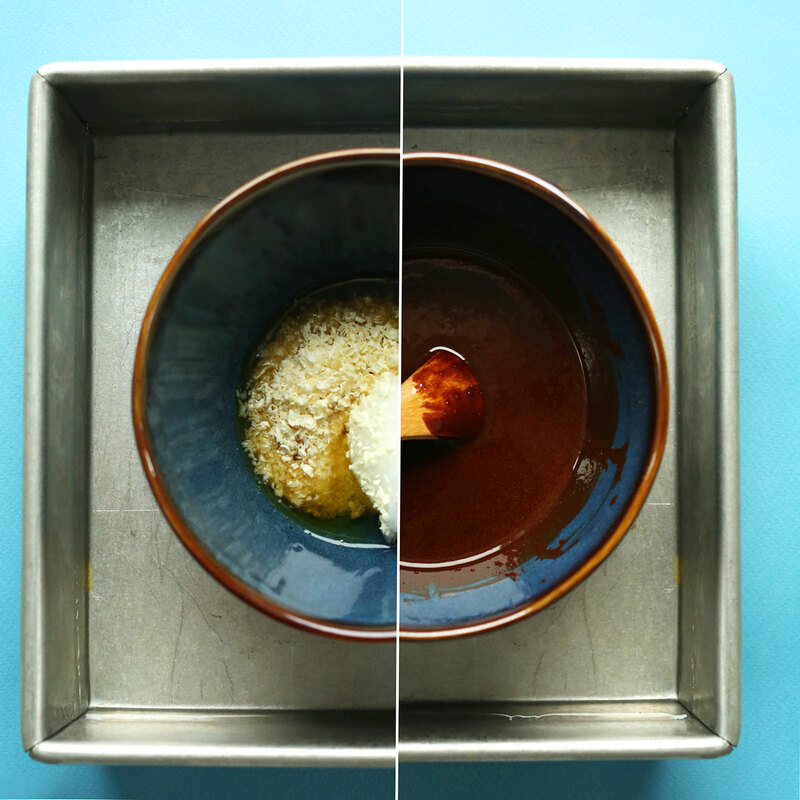 Spoiler alert, this version is even easier, and I found I prefer the raw over the baked! The coating is made from simple ingredients: cocoa butter (see notes for substitution options), coconut oil, cacao powder, and agave nectar or maple syrup. That’s right, these beauties are naturally sweetened, which means they’re basically health food (am I right?). 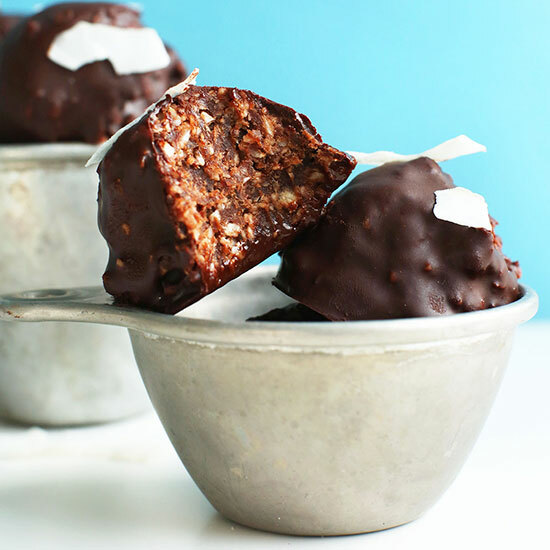 These are great to have around for a healthier dessert or snack. And because they travel well, they also make a great treat to bring along to parties. If you give this recipe a try, let us know! Leave a comment, rate it, and don’t forget to take a picture and tag it #minimalistbaker on Instagram! I’d love to see what you come up with. Cheers, friends! Easy, raw, 6-ingredient double chocolate macaroons! 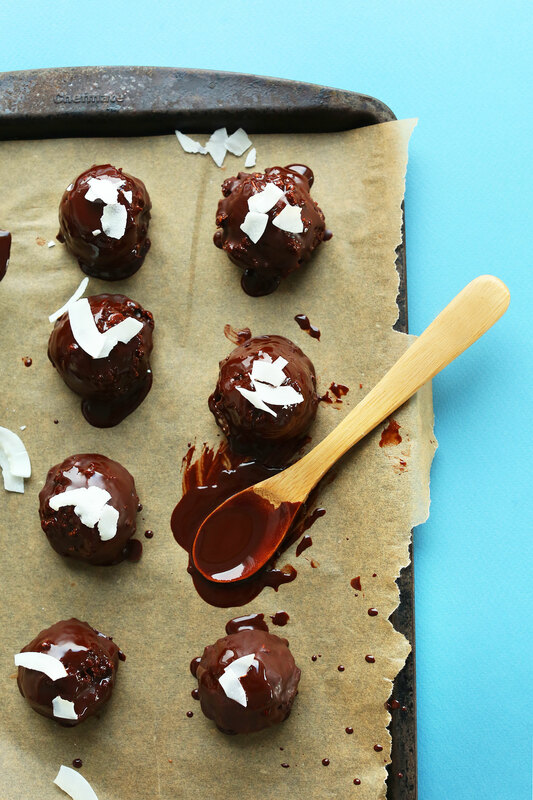 A coconut-date-cacao filling is coated in a naturally-sweetened raw chocolate glaze. SO delicious, and the perfect healthier indulgence! Add pitted dates to a blender and pulse/mix until small bits remain or a ball forms. Add shredded coconut and mix once more to combine. Then add cacao powder and coconut oil (optional), and mix/pulse once more to combine (see photos). Use a Tablespoon (or scoop) to scoop out the filling, and gently transfer to a parchment-lined baking sheet. Repeat until all filling is used - about 9-11 macaroons (amount as original recipe is written // adjust if altering batch size), depending on scoop size - then freeze. Add grated cocoa butter and coconut oil to a ceramic bowl set, then set in a shallow dish (such as an 8x8 baking dish) filled with almost boiling hot water - this will keep the recipe raw - see notes for more options/details. Let the cocoa butter and coconut oil rest, stirring occasionally, until completely melted. Then add your cacao powder and whisk. Add sweetener to taste. I found 4 Tbsp (amount as original recipe is written // adjust if altering batch size) to be about right for me. 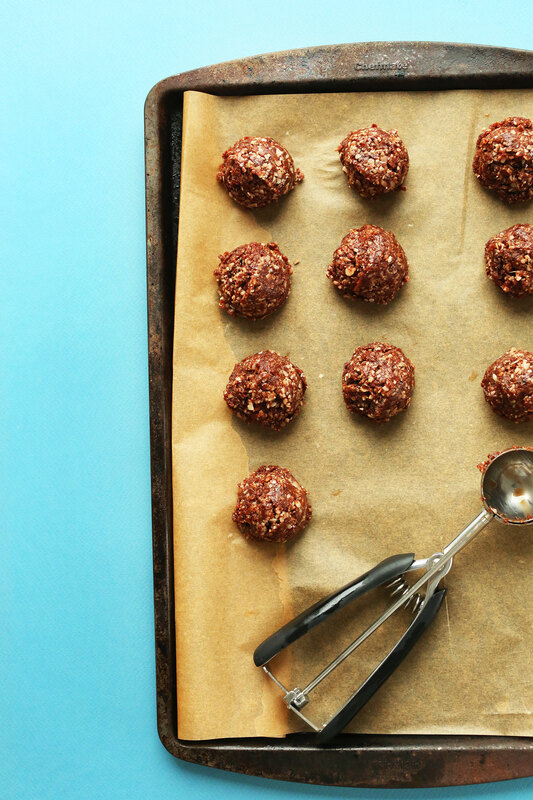 Remove the macaroons from the freezer and dip the bottoms in the raw chocolate. Place back on baking sheet and move back to freezer to set for 5 minutes. Remove macaroons from freezer once more and dip the tops in the chocolate, using a spoon to brush the chocolate up the sides until fully coated. Flip back over and set on baking sheet. Top with a sprinkle of sea salt or a few coconut flakes (optional), then place back in freezer to set. You may have leftover chocolate, which can be used to coat fruit (such as strawberries), or poured into mini muffin liners for individual-sized chocolates. These can be eaten straight from the freezer, but I prefer them at room temperature because they are a bit softer in texture and you can more fully enjoy the flavors. Store leftovers covered at room temperature up to 3 days, in the refrigerator 4-5 days or in the freezer 3-4 weeks. *Raw recipes are those with ingredients not heated above 104 degrees F (40 C). To keep this recipe raw, follow the instructions as written. However, if you're not concerned about keeping it raw, feel free to use cocoa powder instead of cacao powder, or melt the cocoa butter over the stovetop on low instead of in a water bath. 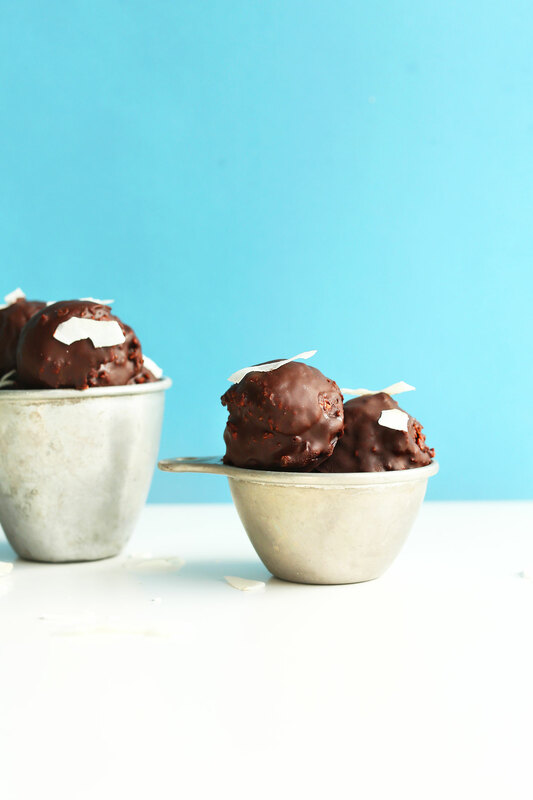 *If you don’t have cocoa butter, you can either substitute all coconut oil, or use this recipe for the coating instead: 1 cup (120 g) finely chopped vegan chocolate + 1 Tbsp (15 ml) coconut oil, melted (amounts as original recipe is written // adjust if altering batch size). *Recipe inspired by the Double Chocolate Raw Macaroons at ZIMT. *Nutrition information is a rough estimate for 1 of 11 macroons calculated using all of the chocolate shell and 4 Tbsp agave nectar. I LOVE your recipes .. !! They are beautiful .. I have been making raw chocolates for many years ,… LOVE them !! I really love the smooth melt in ur mouth texture that using just coconut oil gives … BUT they melt 3 min after being out of freezer and cant really set them out to serve .. Is there a way to add or do u have exact ratio of using both the cacao butter and coconut oil .. so the melt in ur mouth effect is still there …Like the melt away peanut butter eggs I used to LOVE EASTER time .. from Russell stovers ? These are absolutely delicious! I put in half the dates (by accident) and mixed the coconut and cocoa in by hand so I would have larger pieces of coconut. I then topped it with some vanilla sea salt. They look so decadent – like they were bought from some fancy store. Thanks for the recipe! This recipe was super yummy although a blender did not work – I end up just mixing everything up with my hands. Also, I did not have cocount oil so used canola oil in the filling and that worked fine as well. Hmm, maybe the water bath wasn’t warm enough? it happened to me as well, my mixing bowl was corning wear so i just put it straight on my burners for about 30 seconds and melted down very well. Simply incredible and mouth watering. Thanks for sharing the recipe. I made these for company and they are super yummy! Like Samoa Girl Scout cookies without the cookies part, which is great since they are my favorite but I’m not supposed to have gluten so I haven’t had enough them in a long time. Theses are a great substitute. Thanks for the recipe! Love this! It’s hard to find good raw desserts and this looks like the perfect thing! I made the non-raw version of these and they were wonderful. I also just melted semi-sweet chocolate for the coating to save some time. These were described by my friend as the best homemade dessert she’d ever had. Success! Dates, coconut, agave and cacao? Sounds like health food to me…. That means I can eat the entire batch at once – right? I mean…. they’re good for me!!! I have to agree that raw macaroons are better! I had the opposite experience that you did though; I had only tried raw ones before having cooked ones. Cooked ones seemed kind of ‘meh’ comparatively and weren’t as dense and satisfying as raw. I’ve never put dates in them before; I usually do almond flour + coconut oil + currants instead. Okay, my child’s birthday is coming up and is right around Valentine’s Day and I was just starting to think about what kind of dessert to make her! This IS IT! So excited. There’s a Labrador on the second chocolate from the right! Hey, these are nut free! Perfect for my kiddos. Im new at vegan cooking. Please help me understand what cocoa butter product to use. I clicked on the highlighted cocoa butter as instructed and it brought me to a site with different cocoa butters to purchase. But I’m confussed. These products I read about are for body cream uses. What product do I use FOR COOKING? The one I link to is edible! 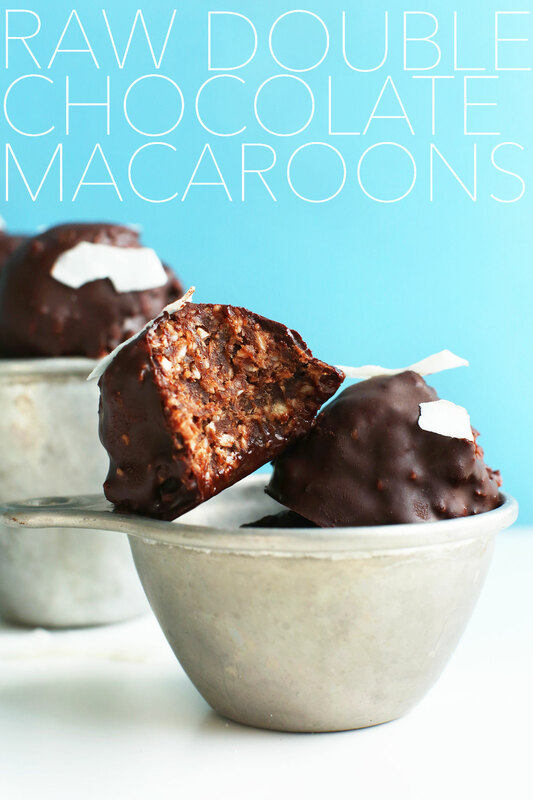 I’ve never tried raw macaroons either, but you have me dying to make these asap! They look delicious! Thanks for sharing the recipe! These look amazing. May sound silly, but I had no idea you could cook with cocoa butter, I use it on my skin. These are the most decadent macaroons I’ve ever seen! Holy heaven. Amazing idea, covering them in chocolate for a bit of crunch! What type of store carries edible cocoa butter? I checked my local grocery store chains and couldn’t find it. These look and sound delicious. is there something that I can substitute for the cocoa butter? Hi Patti! See the comment above, but you can substitute coconut oil. I always buy mine online, which you can find in the ingredients list (linked in blue). These are delicious and filling! My blender had a little bit of a hard time with the solid coconut and date mixture, so next time I would consider using a food processor instead. For the chocolate shell, since I’m out of cocoa butter at the moment, I use about 1/4 cup of coconut oil and 1/4 cup of cocoa powder or to taste, and agave! Definitely a desert I consider always having on hand. Thanks for sharing! Sorry the blender had trouble (depending on the brand, jar size, they sometimes do), but I’m still glad you enjoyed them! YUM! Have you thought about making a version of their salted vanilla bean caramel macaroons? They look divine! Ooh, great idea! Added to the list. I loved macaroons! These look absolutely amazing!! i wanted to let you know that agave nectar is highly processed and has been compared to high fructose corn syrup. i experienced a very strong reaction to it myself – i got the jitters and couldn’t sleep all night after eating it in a dessert that wasn’t even very sweet! when i tried it, some time later, in another dessert, i had the same reaction. that’s when i decided to investigate. 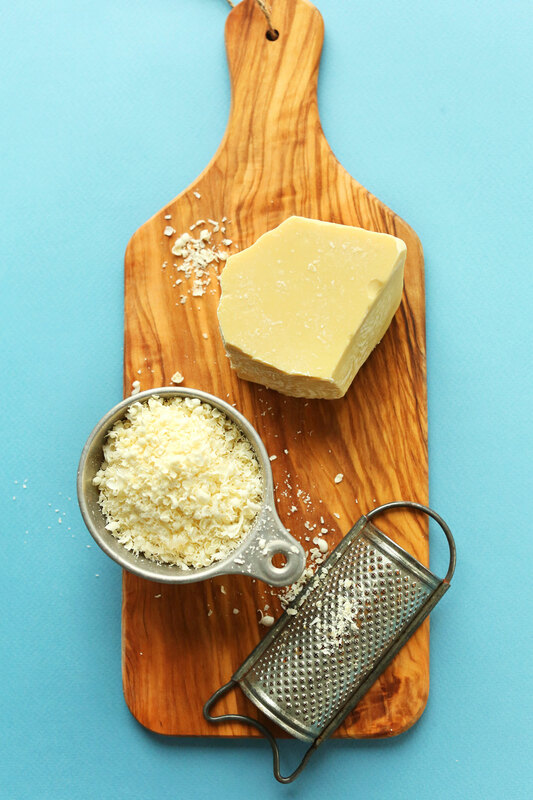 a couple of sweeteners that are not processed are yacon syrup and lucuma. stevia is good too, but only if it is ground from the leaf and is still green; otherwise, it, too, is highly processed. Yikes! Thanks for the info. In your case, I’d recommend maple syrup. Do you think extra coconut oil work if I don’t have cocoa butter? Kids and I would love to make today! Yes, that’s what I did! I do! I find coconut oil makes the chocolate a bit thinner and melts easier out of the freezer. But it does work! How convenient that I have all these ingredients at hand – that never happens! Yay! Hope you love them, Hayley! Girl, these look heavenly. I’ve been craving chocolate a lot the past couple of days (and of course am all out of my dark chocolate bars)… so when I stock back up again, this is first on my list. Plus brownies. Thanks for this lovely recipe, XO. Drool worthy!! These sound so decadent! Where did you get such a large block of Cacao butter? The bag I buy usually is full of small chunks, not sure how well I could grate them (without also grating my hand lol). Follow the link in the ingredients to purchase the one I got! It’s so funny I just finished editing photos for a date and hazelnut candy I have going up on my blog Monday, great minds think alike. This looks great, I can taste it already. Yum, Yum! I love that flavor combo! Hehe. I agree. I love popping on this blog to see what recipe will be posted yet. Dessert, main meal, snack…it’s exciting. Love the coconut as always!!! This definitely looks like it’s going to satisfy that chocolate craving. And I’m trying my bet to be on a raw diet right now to help with health issues and I’m doing my best! These help. So beautiful!! When I read that it was inspired by something from Vancouver I guessed that it was Zimt! Their chocolate is my favourite!! So good and such amazing ingredients. Definitely need to give these a try, so simple!! Agreed! I’m smitten with that brand!